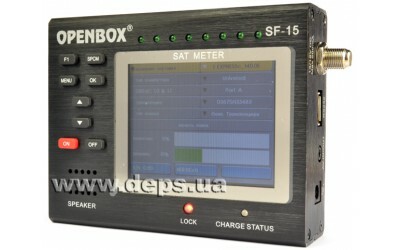 Sat Finder Openbox SF-15 is a compact device for antenna tuning..Device with an LCD display and a spectrum analyzer. 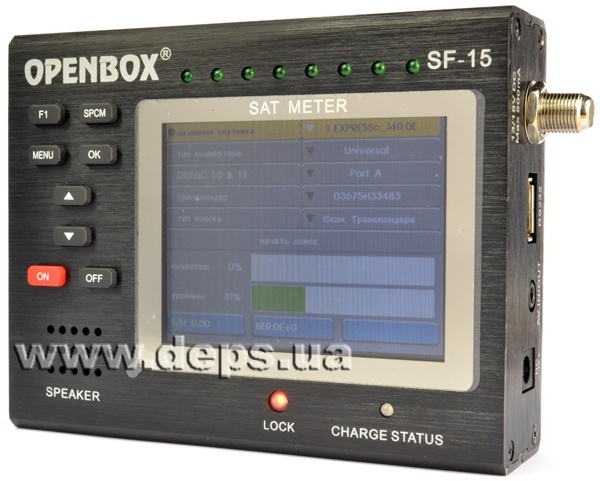 Has an additional scale of LEDs (LED) green fluorescence, which duplicates the testimony of the quality of the received signal with the LCD display. This feature is extremely useful in bright sunlight, when reading data from the LED-display is difficult. The internal menu is extremely simple and understandable even for the person who took the instrument in his hands for the first time. 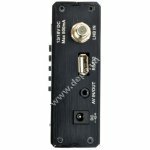 Supports of all the DISEqC protocols and the availability of signal spectrum analyzer will perform all the necessary steps quickly and easily. 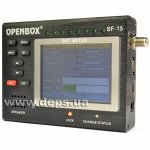 Built-in battery provides up to 4 hours of continuous operation and long stores charge in the “off state”. 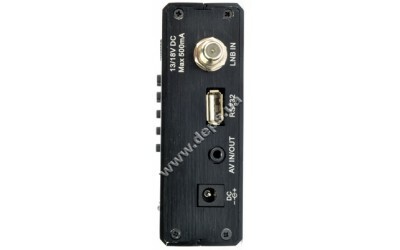 AV-cabel (3,5 Jack <-> RCA).